I saw the Winged Square Quilt Block on Made During Quiet Time and I just kept thinking about it and thinking about it until finally I had to drop everything and go make one myself. 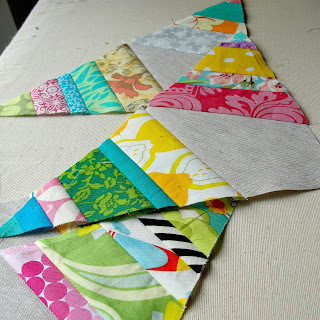 I love how Amy arranged her fabrics, with the center square a blend of 2 main "wing" colors. Super cool and graphic. I chose peach and pink as my two main colors, and used my beloved Sweetwater sewing dictionary fabric as the background. I'm not sure how large Amy's blocks are, but I decided to supersize mine. My finished block is 24.5" square, with each finished half square triangle measuring 4.5" (unfinished). I'm really drawn to pale colors right now, and I love the combo of pale pinks, salmons, peach and lemonade yellows with the creamy background. A fussy-cut Snow White scene from Heather's Ross's Far Far Away II seemed to fit perfectly in this soft block. I'm envisioning mounting and framing this block as a piece of wall art. Thoughts? I'd love some suggestion on this! Have you ever framed a quilt block? Is it hard? Truth: When I started on this sucker a few weeks ago, I figured I'd make a few blocks and then get over it. But I got fully sucked into the fun, and now I'm planning on a queen size bed quilt. A few more rows to go! 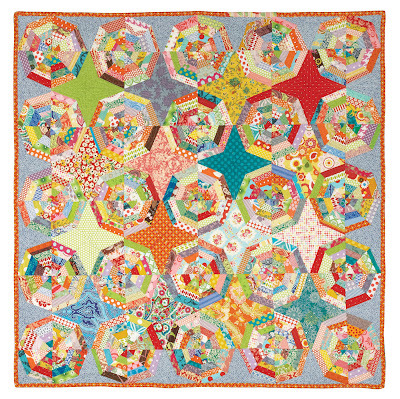 This is my month at my MQG's bee, so all my gals are making me one of these blocks. I gave them a strip from my scrap bag and a strip of the center newsprint, and the rest they're pulling from their own scraps. I should have about enough to finish up once I get their blocks back, and then we'll start playing "Help Kelly Pick a Layout"! I'm running out of floor space - - this sucker's getting BIG! 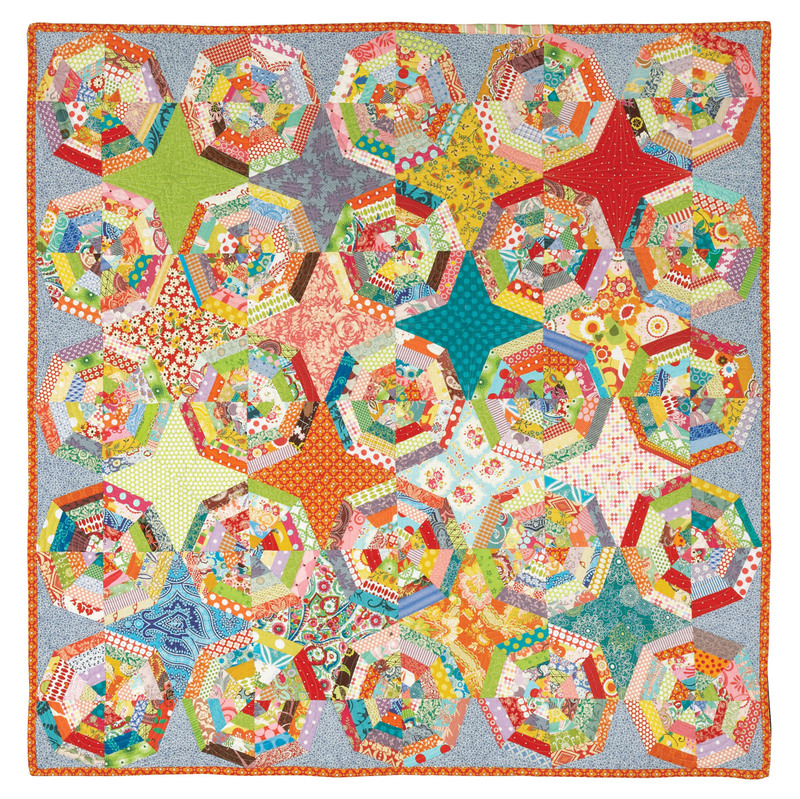 I've been in love with Denyse Schmidt's "Single Girl" quilt pattern forevah. Which is a good thing because you need a timeless, endless love to keep up the motivation on this one. 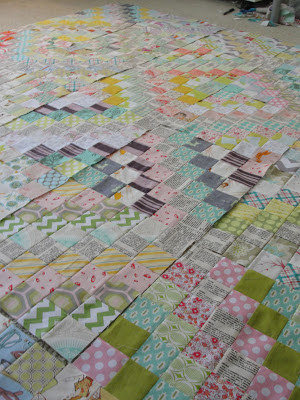 My Rainbow Single Girl quilt is truly going to be a prized possession. If I can ever finish it! Yeah, I have a thing for rainbow order. And polka dots. A bit of a sneak peak of what it will look like. One quarter of one block all done! I love the colors against the white background. What's your current quilt obsession?? 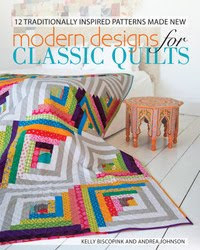 Do you remember this super-fly quilt from Modern Designs for Classic Quilts? This beauty is Andie's creation, and I have been drooling over it since the first time she showed it to me. Rather than create a distraction, grab the quilt and run (because I really don't like to run), I decided to use my handy skills and make one of my own. Some super delish strings, all ready to go! 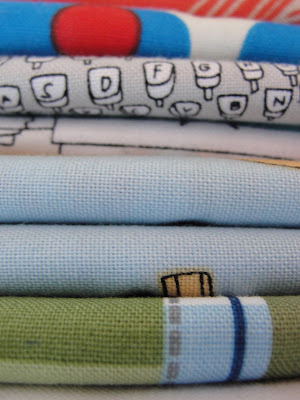 But I decided I'd rather make all the centers consistent using Essex Linen in flax. Here's some progress! 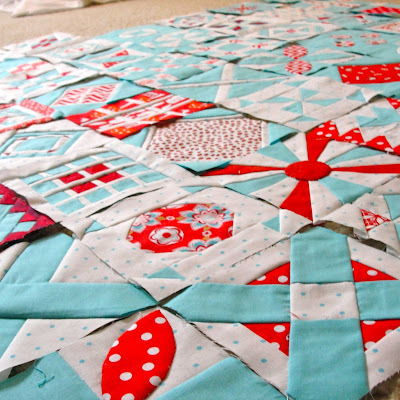 Have you ever done any string piecing? A lot of paper piecing this week, and I tackled another appliqué block. 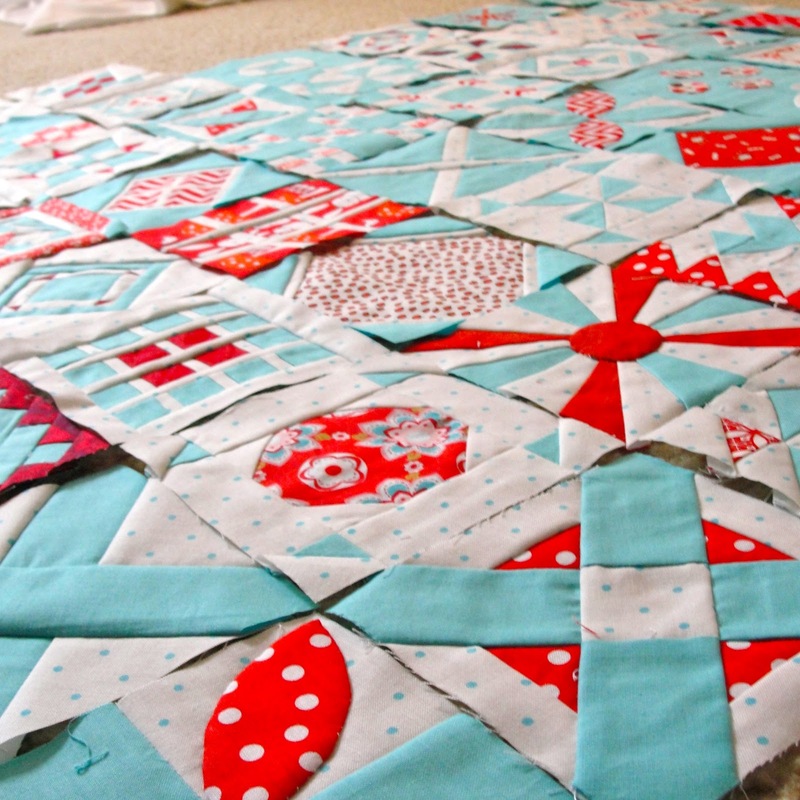 I'm getting the hang of it, but definitely going to be relying on some good quilting to smooth over the rough parts... This is a learning process, though, and I'm definitely learning! 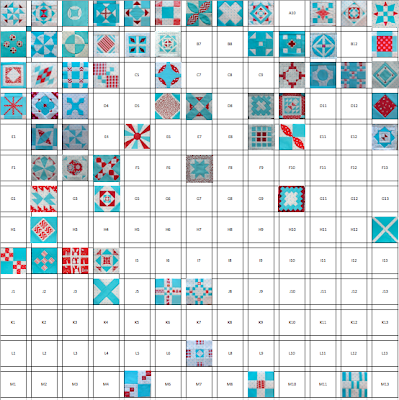 After 13 weeks, I'm up to 65 Modern Dear Jane blocks. 65 down, 104 to go! Some people buy shoes. I buy fabric. 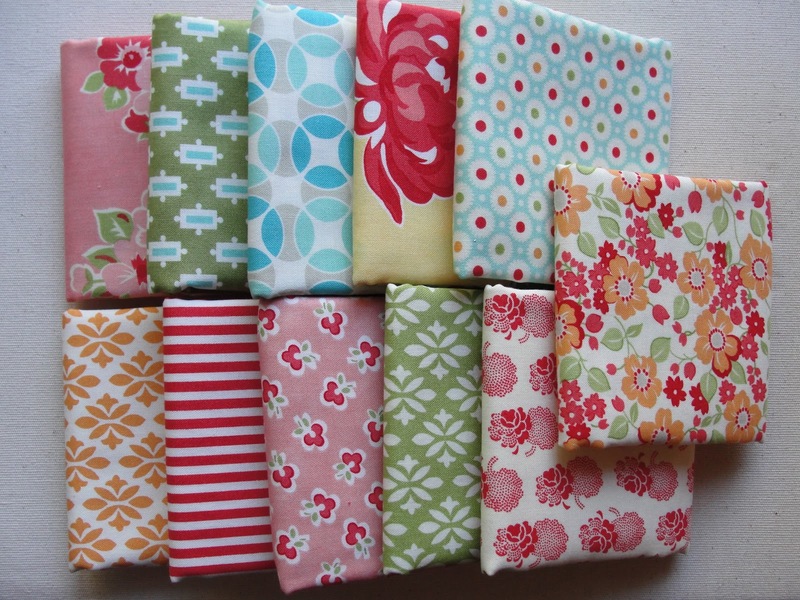 11 Bonnie & Camille fat quarters, all for me! Bicycles, madras, text, glasses, typewriters, elephants and feathers. I'll take it. Buy any delish fabric lately? 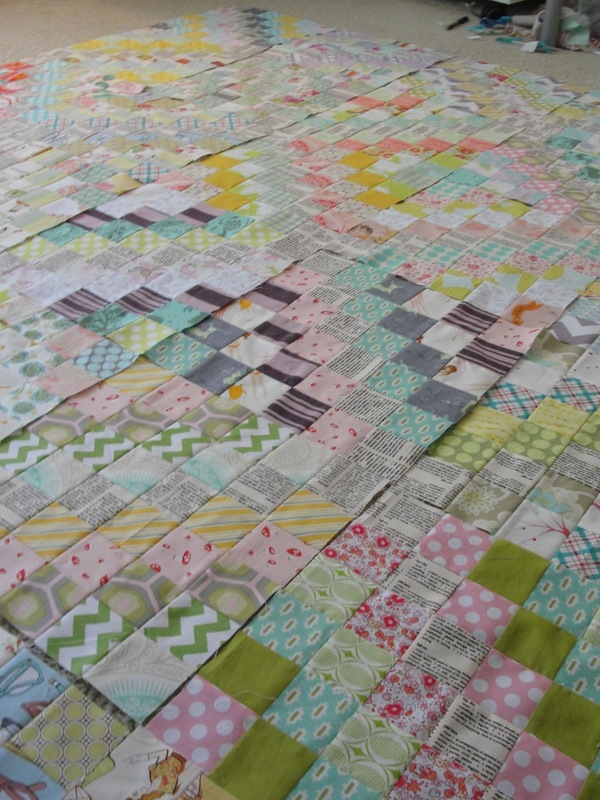 I have been resisting laying out all of my Dear Jane blocks side by side. I'm not entirely sure why exactly, except that finally laying out blocks feels like my reward at the end. Does that make any sense? Anybody else get that? Things in my non-sewing, non-blogging life have been great and very exciting, but super stressful and time consuming the past few weeks. All good things, but I've felt so sapped at the end of each day that, after work, I haven't had the energy to do any sewing. So, I'm about 2 weeks behind on my Baby Jane, but I'm back on target and trucking right along again! I have to say, I'm really loving how it's coming together. Laying all 60 completed blocks out has re-inspired me. 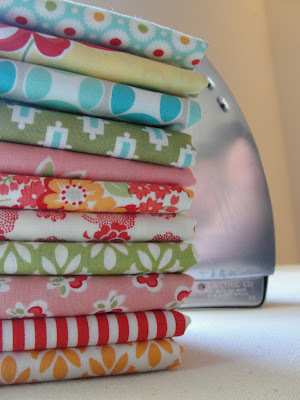 Back to the sewing machine!